The city of Boston said hail and farewell to one of its signature characters this past week. Her call, two words, turned Mary Fiumara into an icon of the North End. “Anthony! Anthony!” she shouted from a window on Powers Court in a classic 1969 TV ad spot, prompting the youth to race home for a hearty dinner of Prince Pasta. Mrs. Fiumara, who had lived in that Italian enclave for three-quarters of a century, died Tuesday. She was 88. 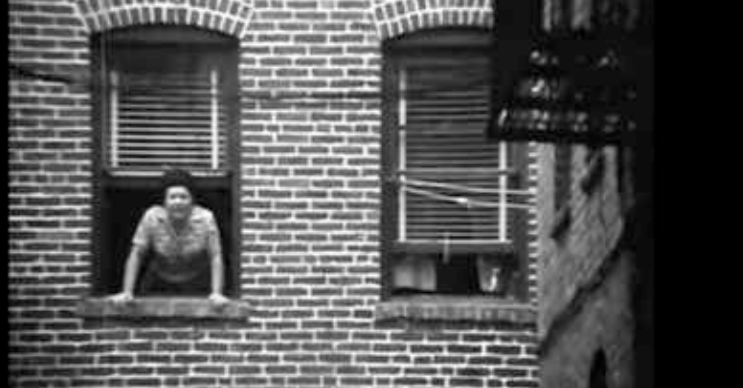 Anthony Martignetti, who at the age of 12 was the youth in the “Wednesday is Prince Spaghetti day” commercial, recalled Mrs. Fiumara as “a legend” of the neighborhood, even before she captured the hearts of TV viewers. Not to get technical about it, but what are the odds that a North End mom yells “Anthony! Anthony!” out her window and only one kid runs home? It’s the mid-’60s and the tough redheaded girl next door (whose name I don’t remember but I bet my all-knowing sister Diane does) has a beef with me and she yells at the third-floor walkup my family lives in at 89th and 3rd . . .
Not to get technical about it, but what are the odds Jackie’s Agnes would come to the window? Regardless, rest in peace, Mary Fiumara. This entry was posted in Uncategorized and tagged 89th and 3rd, Anthony Martignetti, Boston Globe, Jackie's Agnes, Mary Fiumara, North End, Prince spaghetti, Steve Annear. Bookmark the permalink. Thanks. Stay warm and dry, eh? Is this the start of Part 1 of your triology? Ok…So what was spaghetti day in the Carroll household? We were a Chef Boyardee family, Mudge, so spaghetti day was pretty much whenever there was a can or two around.